Not a creature was stirring, not Coug, Dawg, or mouse. In hopes that Kickoff soon would be there. While visions of footballs danced in their heads. 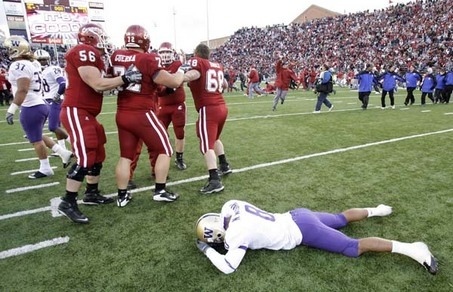 Had just logged off of Cougfan for a long winter’s nap. Tore open the shutters and threw up the… Seriously, what’s a sash? But a Butch T. Coug, and 11 athletes in Coug gear. I knew in a moment we’d hear the Jaws song. “Now Leaf! now, Gesser! now, Bledsoe and Rypien! On, Bumpus! On, Hanson! on Thompson and Gleason! To the top of the hill! to the top of the Bryant Hall! With the dreams of Cougar nation, and Old Crimson too. Panting and pawing, a lame puppy woof. And his jersey is never tarnished with ashes and soot. For when he points and says “Go Cougs,” that way and back. His color is Crimson, don’t ever think cherry! And his road uniform is as white as the snow. And dreams of waving it holding a Rose in his teeth. For First Downs, and running backs that make defenders’ legs jelly! And I have to admit, I’d like to see some myself! We’ll all see that sportscaster put on Butch’s head. So yell, clap, and chant and scream like a jerk. For tomorrow is game day so pretend it’s the pros! When the QB leaves center and goes to the pistol.